When I was a child, American chop suey was my very favorite thing to eat, and even now it is often my first choice when I’m looking for a tasty, quick, and easy something to make for dinner. I once read somewhere that American chop suey is popular throughout this country, but that it is made differently in different regions. I suppose the way we make it is the New England version. My mother made chop suey with elbow macaroni, onions, “hamburg,” and either home-canned tomatoes or tomato soup… that was the standard recipe. When I make this dish for my family, I always use ground turkey because we do not eat beef, and I often use gemelli pasta or other pasta shapes instead of elbows. I also use concentrated crushed tomatoes instead of tomato soup and a small amount of the pasta water (the starch in the pasta water thickens the sauce). Sometimes I use fresh tomatoes. Sometimes I add green peppers or mushrooms, garlic and basil or oregano. 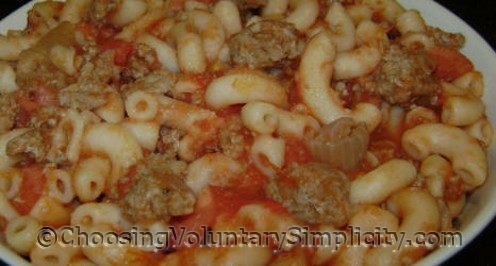 Eight ounces of grated cheddar cheese mixed in, or Parmesan cheese over the top, is delicious too… but my favorite version of this dish is still the basic combination of macaroni, ground meat, tomatoes, and onions. Cook macaroni. Drain and set aside. Sauté ground meat and chopped onion. Season with salt and black pepper. When meat and onions are cooked, drain off any grease. Simmer tomatoes, meat, and onions for about fifteen minutes. Mix in macaroni and serve. My Dh and I both grew up eating this and I have been cooking it all through my marriage. We call it Goulash. My recipe is just about like yours except we use tomato sauce instead of tomato soup. Your crushed tomatoes idea sounds good too. Actually, I should have said that we call it goulash too. Isn’t it funny how neither name really fits the dish? I had never heard of this but I’m going to try it tonight. Thanks for all the great recipes. I have tried several recipes on your site and haven’t hit a bad one yet. :-) Thanks. My kids love this, so did my husband and me. This will certainly be come a favorite quick meal for us. Did you think this would be good with ground pork? This sure brings back the memories. I can remember eating this when I was a kid and visited my gram in Vermont. She was a good cook and I loved her chopsuey. My mom on the other hand made it a couple of times and it wasn’t too great. Sadly she wasn’t a very good cook. :( I’m going to make some chopsuey of my own this weekend and use turkey like you do. Thanks for sharing. My mother used to make this for me when I was a little boy. We called it goulash too. I think it was about my favorite meal when I was growing up, but you know, I haven’t had it once since I was about 18. I don’t think my wife knows how to make it but she has copied the recipe and has promised that she’ll give it a go. Thanks for the memory! Betty, you’re right… not all chop sueys are created equal! But when it’s made well, it is good. I have to admit that it still is one of my favorites. And yes, Rita, I don’t see why you couldn’t make it with ground pork or any ground meat. The flavor will be slightly different, but still delicious I bet. I absolutely love your page and all of your recipes. I have bookmarked you and will return again and again. Thanks for giving me some of the older more simplistic recipes like my grandma used to make. I’m making it tonite in his honor and sending the recipe to his two sons. This is one of my favorite things! We just call it “Hamburger Macaroni Casserole.” I didn’t know other people ate it–I thought my mom just made it up!! Ours had chunks of onion and celery. Mmmm. Equally good with ground beef or ground turkey. My mom used to make this all the time and she passed last year and I miss it! She made it a little differently. Once the onion was browned she added the hamburg and then salt and pepper and (maybe) a couple other ingredients to flavor, one may have been parm cheese. Then she add a small can of tomato sauce, (not paste). After cooking the elbow macaroni she coated a baking dish with Pam, so not to stick and then opened a large can of tomato sauce and put a thin layer on the bottom. She mixed in some elbows, and some of the prepared meat and just keep adding more sauce and meat in layers just to get it pre-mixed. Then she took another small can of tomato sauce and mixed everything with a large spoon, (possibly adding some more salt and pepper). The last step was to sprinkle some parm cheese on top and to put it in the oven for about an hour at 350. (Depending on how much you make your time may vary). This was always a family favorite. Lots of parm cheese on top and you had a great meal. Thinking about this I’m going to make some up this Sunday for me and my brothers. Also you can change up the sauce a up little if you want to spice it differently. If you want it a little more spice add some mustard to the mix. Or if you want it a little tangy try ketchup. Both and you have mix but most only like one or the other. Lastly if you need something quick for a school night or the kids have to be at somewhere early, Chef Boy-Ar-Dee Beefaroni is a good base and add some hamburg and onions to bulk it up with salt and pepper to taste and skip the oven, just serve it straight from the pan. I’ve used this method myself but adding ketchup,salt and pepper to spice it up as the base out of the can is sort of bland. Not as good as the real thing but good if you need to be down and dirty in a hurry. I made this last night, although we could not decide what is was called in our youth – from where I am, Newark, NJ, it was American Chop Suey and was a regular feature of the Ann Street School cafeteria in the 60’s and early 70’s. He says in the country where he grew up, it was goulash. Whatever it was, and whatever variation, it is up there with mac n cheese and meatloaf for comfort food. This just makes me smile :) We had this growing up, as do we now. My grandma made it so my mom made it, but they both used canned tomatoes, sometimes stewed, and a glog of worcestershire. I don’t like it w/tomato soup, but it’s still goulash, all the same. My BFF makes it w/the soup as does her mom. When I make it now I add a bit of green pepper and some worcestershire. I wanted to tell you how excited I am to have found the blog. 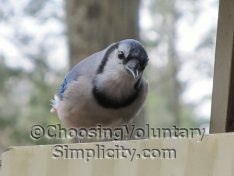 I’ve been taking steps towards simplicity and a more natural way of living for several years, so your page was quite a find. I’ve already bookmarked it, subsribed, “liked it”, and am pinning posts as we speak. Thanks, again!! My grandma used to call this Goulash, too. She was from North Dakota, maybe that had something to do with it. It’s obviously neither Goulash or Chinese, but it’s tasty and filling for a family on a budget. She used some green pepper to liven it up. She also used to make a cabbage soup with hamburger, bacon and rice. She called it Governor’s Soup (my mom still makes it when she’s “homing”). I’ve never been a huge fan of it, but my family loved when either my mom or my grandma would make it. With enough black pepper and salt combined with bread and butter it was fine for me!